If you are in the Chicagoland area, and are attending the Oak Park Microbrew Review this Saturday, August 15th, then you are in luck! I will be there, handing out some Beerfest Bingo cards (made by yours truly), and if you play the game during the fest, you could win a FREE piece of artwork from my Etsy store! 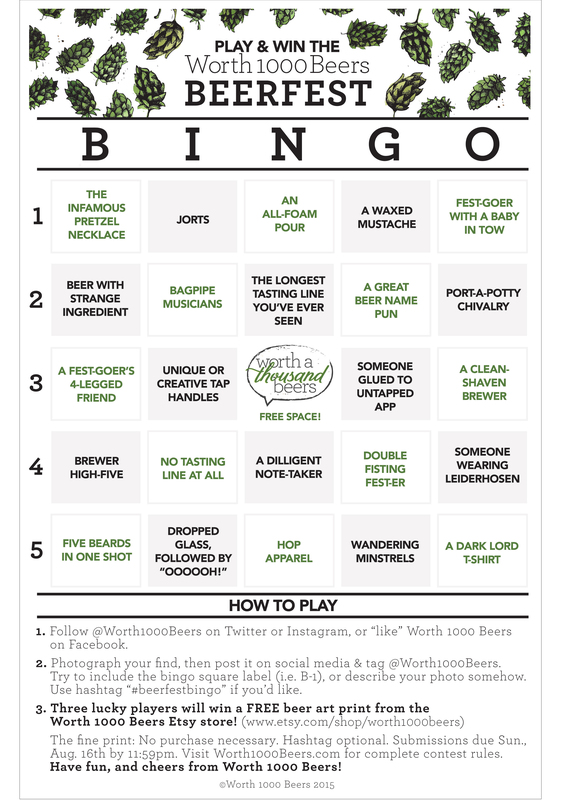 In order to play you must either print out a copy of the Beerfest Bingo card (below), or find me or one of my foolish minions helpful friends/loved ones and grab a hard copy right out of our hot little hands. You’ll recognize us–we’ll be the ones holding large handfuls of bingo cards. 3. Three lucky players will each win one FREE beer art print of their choice (shipped to them free of charge) from the Worth 1000 Beers Etsy store! 3) One winner who logs the most found squares from their BINGO card. In case of a tie, I will randomly choose from multiple submissions that fulfill this requirement. While the idea is that you play DURING the Oak Park Microbrew Review, I will accept your submissions until 11:59pm the following day, Sunday August 16th, (Yes, I know how it is and I will make allowances for inevitable beerfest shenanigans/forgetting to submit/losing your mind/typically terrible beerfest phone signal situtations.) so power through that hangover and get your submissions posted by Sunday night! You may bring your own printout of the Bingo card, or grab a hard copy from me at the fest. You must attend the Oak Park Microbrew Review in Oak Park, Illinois this coming Saturday, August 15th, 2015. You must be a follower of @Worth1000Beers on Twitter, Instagram, or “like” Worth 1000 Beers on Facebook to be eligible to win. No purchase necessary. I love you. What? Shhh.